4 People Not Profit’s very special Christmas party comes to the main lounge in the Marine on Friday December the 19th, from 7.30pm till late. We are supporting Actionaid’s Campaign ‘Towns against Tax dodging’ and urging people to send off action cards to support this campaign. 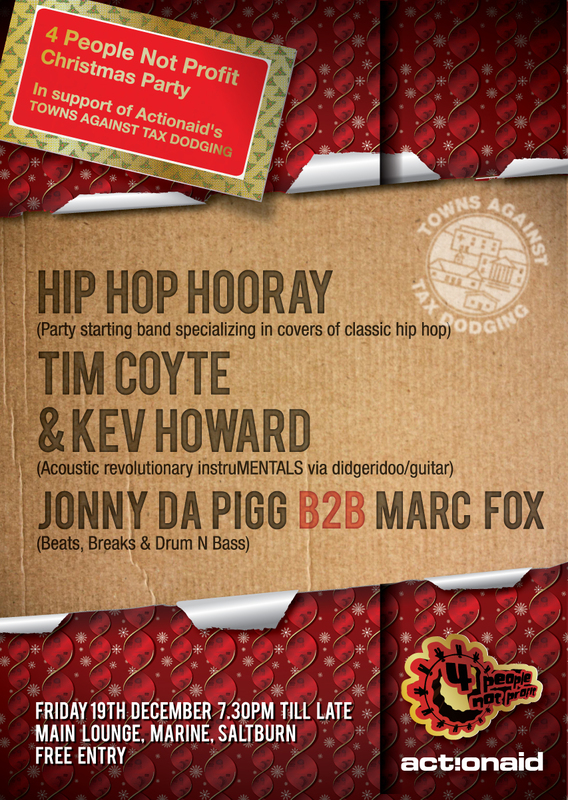 The night will be headlined by Newcastle’s party starting Hip hop covers band Hip Hop Hooray. With support from Tim Coyte and Kev Howard acoustic revolutionary instrumentals on didgeridoo and guitar. And a special back2back set from our resident DJ’s Marc Fox and Jonny Da Pigg, playing the best in Breaks and Drum n Bass. So get down for 4 People Not Profit’s last gig of the year for some guarenteed christmas craziness! !